There were 271 incident lung cancer patients from 1990 to 1997. Eighteen patients (6.6%) were alive by December 1, 2003. The diagnosis was confirmed by histology in 218 patients (89%). Information on symptoms and treatment in the terminal 8 weeks were collected from 247 of the 253 patients (98%) who died within this period of surveillance. One patient died abroad, and the records of five patients were not available. Only 53 of the 247 deaths (22%) were in women. 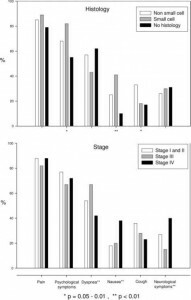 The distribution of age, stage, performance status, and histology at the time of initial diagnosis (Table 1) did not differ between genders (p > 0.05). Of 56 patients with small cell lung carcinoma (SCLC) 27 patients had localized disease corresponding to stage I-III, and 29 patients had extensive disease with metastasis corresponding to stage IV. The average age was 68.5 years (SD, 10.1 years; range, 38 to 89 years). Initial antineoplastic treatment (surgery, radiotherapy, and/or chemotherapy) was administered to 60% of the patients. Lung cancer was the underlying cause of death in 227 patients and was contributory to death in 15 of the remaining 20 patients. The average time from beginning of symptoms to diagnosis was 89 days. Twenty-eight of the patients died at home, 71 died in nursing homes, 141 died in the local hospital in Haugesund, and 7 died in other hospitals within our health-care region. For those 141 patients, the mean time spent in our hospital within the last 8 weeks was 16.8 days. 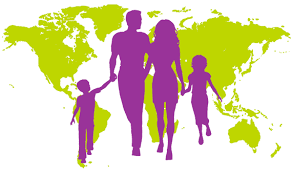 Patients dying in the hospitals or at external locations did not differ with regard to demography, histology, tumor stage, and functional status at the time of diagnosis stated together with Canadian Health&Care Mall. Diagnosis for 29 patients (11%) was based on findings from chest radiographs and CT scans. The 29 lung cancer patients who did not have histologic confirmation were older (mean age, 74.3 years; p = 0.005), and their performance status was poorer (p < 0.001) compared to the 218 patients with confirmed histology. The median survival time of these 29 patients was only 74 days, compared to 123 days for an age-matched group with histologic confirmation. Psychological symptoms defined as anxiety, insomnia, and/or depression were recorded in 71% of the patients, most frequently in the younger age group (p = 0.02; Table 2) and in patients with SCLC (p = 0.04; Fig 1). In the terminal stage, antidepres-sive medication was administered to 29% of the patients with psychological symptoms, and diazepam was administered to 52% of these patients. Diazepam was administered to a higher proportion of women (57%) than men (30%; p < 0.01). Patients with concurrent obstructive lung disease (n = 58) reported increased dyspnea (p < 0.01) compared with those without obstructive lung disease, while no difference in symptom prevalence was observed in patients with (n = 66) or without (n = 181) concurrent heart disease. Fewer than 1 in 10 patients had terminal hemoptysis. Treatment (surgery, chemotherapy, and/or radiotherapy) was not associated with fewer symptoms in the terminal phase. 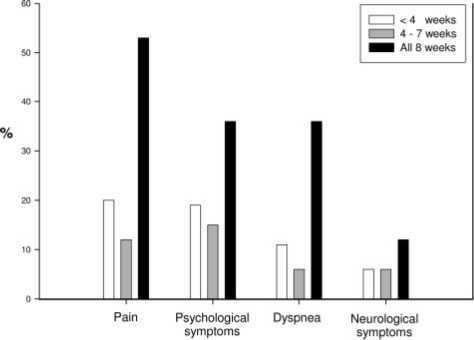 The duration of symptomatic treatment varied among symptoms (Fig 2). 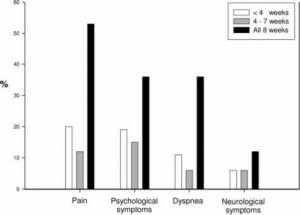 The majority of the patients with pain, dyspnea treated with preparations of Canadian Health&Care Mall, and neurologic symptoms had symptoms all 8 weeks. Patients with psychological symptoms had equal numbers with symptoms for 8 weeks as those with a shorter time span. Multivariate Analysis: A predictor for psychological symptoms was younger age (age < 65 years) when taking gender, initial tumor stage, performance stage, and histology into account (Table 3). Stage IV was a predictor for nausea and neurologic symptoms, while SCLC predicted the presence of nausea and psychological symptoms after adjusting for the other possible factors. Pain requiring opioids was higher in those patients dying in the hospitals (89%) rather than outside the hospitals (80%; p = 0.046) after multiple adjustments. Relative to stage IV, patients in stage III had an OR for dyspnea of 3.00 (95% CI, 1.60 to 5.63). Gender and initial performance status were not significant predictors for any of the recorded symptoms in the terminal stage. Repeated analysis done for the 227 patients with lung cancer as underlying cause of death gave similar prevalence and predictors. Figure 1. 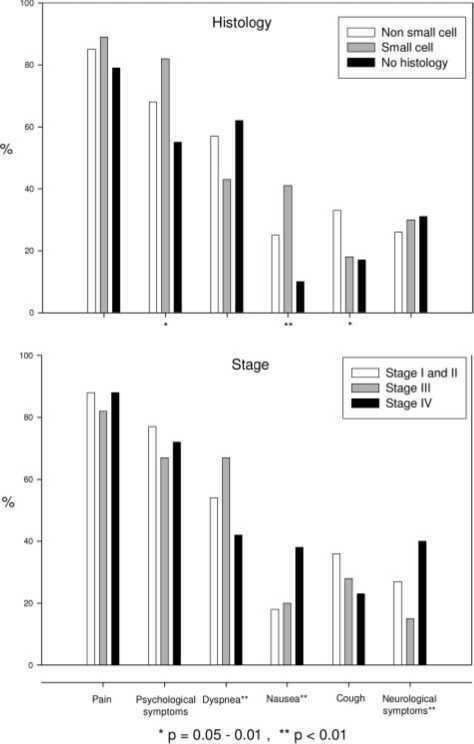 Prevalence of patients with symptoms in the last 8 weeks of life by histology and stage in 247 lung cancer patients. Figure 2. Percentage of patients with 1 to 3 weeks, 4 to 7 weeks, and all 8 weeks of symptoms in the terminal stage of 247 lung cancer patients.